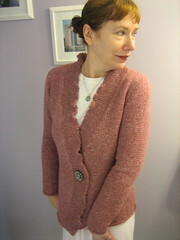 I knit this cardigan using Rowan Felted Tweed and the Elise pattern from Rowan Vintage Knits. Brendan found the brooch at the Bridge Mills in Galway. It’s already gotten six faves on Ravelry. Mealey is chuffed and so is Mama. You can follow all the replies to this entry through the comments feed. Hi! I'm Camille. I only write stories that could never ever happen in real life, though I do believe in real-life magic. If we were in the same room I'd fix you a cup of tea, but for now we'll have to settle for a virtual connection. I'm really glad you're here. © 2019 Camille DeAngelis. Website by SixteenJuly. Download free sample chapters from Life Without Envy!